Representative Ilhan Omar speaks during a press conference outside the U.S. Capitol in Washington, DC, on Feb. 7, 2019. 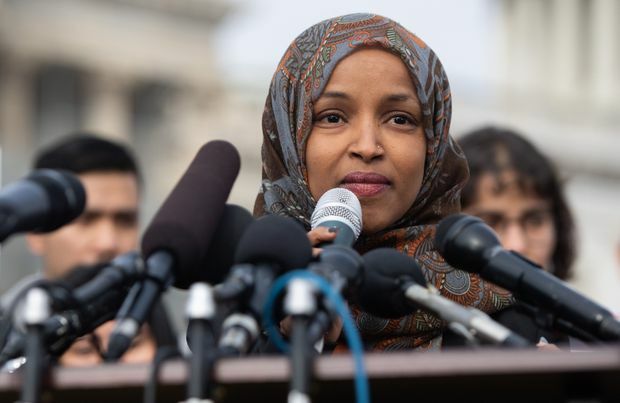 Freshman Democratic Rep. Ilhan Omar “unequivocally” apologized Monday for tweets suggesting that members of Congress support Israel because they are being paid to do so, which drew bipartisan criticism and a rebuke from House Speaker Nancy Pelosi. In a pair of tweets over the weekend, Omar criticized the American Israel Public Affairs Committee, or AIPAC. “It’s all about the Benjamins baby,” she wrote, invoking slang about $100 bills. That sparked Pelosi’s first public rebuke of a freshman lawmaker who had helped flip the House from Republican control and is part of a record number of women in Congress. It also was a stark exposure of an increasingly tense split among Democrats over U.S.-Israeli policy ahead of the 2020 elections. None of the Democratic presidential hopefuls weighed in publicly as their party’s House leaders chastised Omar. “It’s shocking to hear a Member of Congress invoke the anti-Semitic trope of ‘Jewish money,“’ Engel said. AIPAC is a non-profit organization that works to influence U.S. policy toward Israel. While it is barred from directly donating to candidates, it encourages its more than 100,000 members to do so and to be politically active. Omar supports a movement known as BDS, for “boycott, divestment and sanctions” aimed at Israel. And it’s not the first time she’s fought accusations of anti-Semitism. She insists her rejection of the Israeli government refers to its stance toward Palestinians and is not directed at Jewish people. Omar has expressed regret for tweeting in 2012: “Israel has hypnotized the world, may Allah awaken the people and help them see the evil doings of Israel.” She said the statement came in the context of Israel’s treatment of Palestinians in the Gaza Strip. The controversy over Omar’s remarks stretched beyond Capitol Hill to the crowded Democratic presidential race. Minnesota Sen. Amy Klobuchar supported the Middle East bill, while her potential presidential rivals – senators Elizabeth Warren of Massachusetts, Kamala Harris of California, Cory Booker of New Jersey, Kirsten Gillibrand of New York, Bernie Sanders of Vermont and Sherrod Brown of Ohio – all opposed it. Several of those Democrats had raised concerns that the bill’s bid to rein in anti-Israel boycott efforts risked violating the constitutional rights of activists, although all the senators are opposed to the Palestinian-led push itself.